Keith Whelan, the 'Naked Adventurer', had set off on his journey last month but has been forced to return to land for medical treatment. 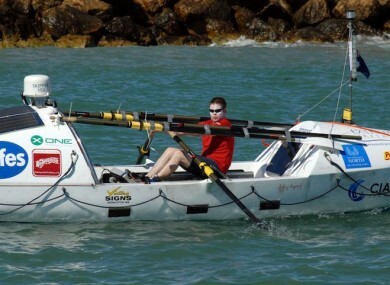 AN IRISH ROWER hoping to become the youngest man ever to row solo across the Indian Ocean has been rescued off the coast of Western Australia, after sustaining a minor head injury. Kildare native Keith Whelan – a.k.a. the ‘Naked Adventurer’ – has had to put his charity endeavour on ice after his boat was hit by a large wave last night, banging his head against a bolt and leaving him with a substantial gash. A blog post on Keith’s website said Whelan had been able to stop the flow of blood himself but decided to seek medical help at first light this morning, when he made a call to a friend in the UK through his craft’s satellite phone. That friend was then, in turn, able to make contact with Australian maritime safety authorities who issued a call to nearby craft to recue him. A cargo boat about 14 miles away was then diverted to pick him up, an Australian Maritime Safety Authority spokeswoman told the Irish Echo. That ship is now en route to the mainland, where Keith will be assessed and receive medical treatment if necessary. He is meanwhile being attended to by medics on board the cargo ship. An update to Keith’s Facebook page said his boat would require some repairs, having been damaged as it was hoisted on board the Fugisuka cargo ship, and described the mishap as the “worst 48 hours imaginable”. “He’s received a gash to his scalp, from the information we have the solo rower said he most probably needs about 14 stitches,” a Western Australia water police spokesman said. Keith had set off on his 6,000km trek on May 7 from the Geraldton tip of Australia’s west coast, but had been forced to spend some time docked at the Abrohlos Islands due to poor weather. Email “Naked Irish rower rescued after sustaining head injury off Australia”. Feedback on “Naked Irish rower rescued after sustaining head injury off Australia”.